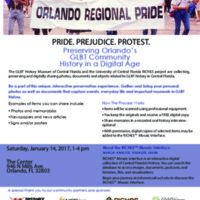 A flyer for a history harvest conducted by the GLBT History Museum of Central Florida and the University of Central Florida's RICHES program on January 14, 2017. The harvest was held at The LGBT Center of Central Florida, located at 946 North Mills Avenue in Orlando, Florida. The purpose of the event was to collect, preserve and digitally share photographs, documents and objects related to GLBT history in Central Florida. Original color flyer: RICHES, University of Central Florida, Orlando, Florida. Originally created and published by RICHES. Perez, Paola. "The LGBT+ Center of Orlando will open second location in Kissimmee on August 15." Orlando Weekly, July 20, 2018. Accessed February 25, 2019. https://www.orlandoweekly.com/Blogs/archives/2018/07/20/the-lgbt-center-of-orlando-will-open-second-location-in-kissimmee-on-august-15. RICHES. “Pride. Prejudice. Protest..” RICHES of Central Florida accessed April 20, 2019, https://richesmi.cah.ucf.edu/omeka/items/show/10554.